5 Giants Pitchers Give Up 5 Runs In 6th As Royals Even World Series : The Two-Way Butler, Perez and Infante each knock in two runs, and Kansas City's powerful bullpen shut out the Giants in the final four innings of a 7-2 win over San Francisco. The series resumes Friday. After the Royals' postseason winning streak was snapped Tuesday and the Giants led off Wednesday's game with a home run, one could excuse Royals fans for thinking the glow around this season was finally dimming. 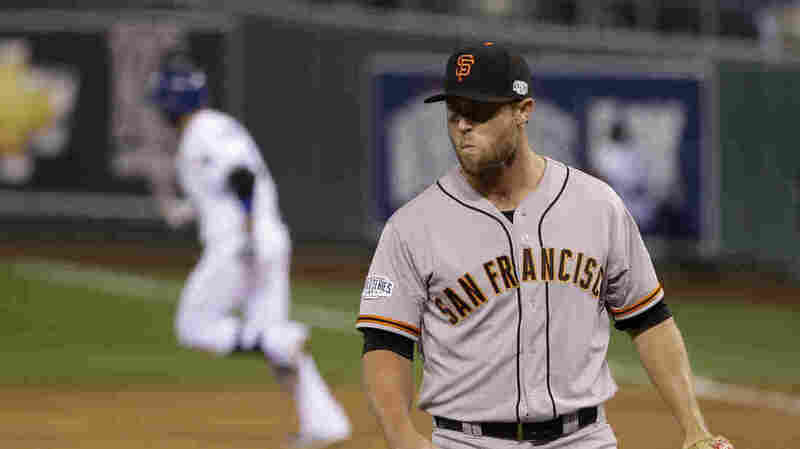 But Kansas City quickly recovered, and had the game even, 2-2, before tearing through Giants pitcher after Giants pitcher in the sixth inning and handing the ball to their dominant bullpen. The 7-2 win evened the World Series at one win per team. The Royals' big inning included a two-run home run by second-baseman Omar Infante off Giants rookie Hunter Strickland. The rookie has now given up five home runs in five innings of postseason relief, tying a record, and got into a shouting match with Salvador Perez as the Royals catcher crossed home plate ahead of Infante. 1. Lorenzo Cain singles on a soft fly ball to center fielder Gregor Blanco. 2. Eric Hosmer walks. Lorenzo Cain to 2nd. Pitching Change: Jean Machi replaces Jake Peavy. 3. Billy Butler singles on a line drive to left fielder Travis Ishikawa. Lorenzo Cain scores. Eric Hosmer to 2nd. Pitching Change: Javier Lopez replaces Jean Machi. 4. Alex Gordon flies out to left fielder Travis Ishikawa. Pitching Change: Hunter Strickland replaces Javier Lopez. With Salvador Perez batting, wild pitch by Hunter Strickland, Eric Hosmer to 3rd. Terrance Gore to 2nd. 5. Salvador Perez doubles (1) on a line drive to center fielder Gregor Blanco. Eric Hosmer scores. Terrance Gore scores. 6.Omar Infante homers (1) on a line drive to left field. Salvador Perez scores. 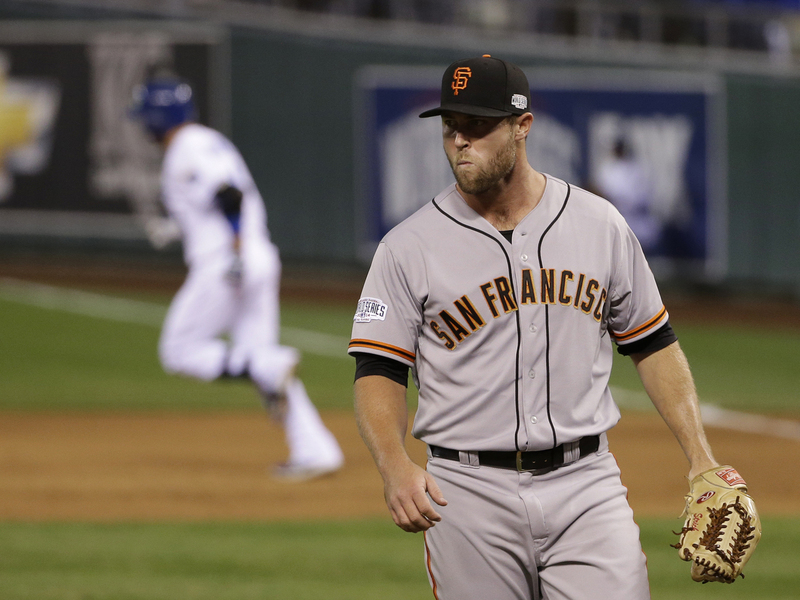 Pitching Change: Jeremy Affeldt replaces Hunter Strickland. 7.Mike Moustakas singles on a line drive to center fielder Gregor Blanco. 8.Alcides Escobar grounds into a double play, third baseman Pablo Sandoval to second baseman Joe Panik to first baseman Brandon Belt. Mike Moustakas out at 2nd. The series moves to the Bay Area for the next three games, starting Friday at 8 p.m. ET.